Forget Patti Stanger -- is Barbara Walters the true Millionaire Matchmaker? According to reports, the TV veteran is responsible for setting up her cousin Nancy Shevell, 51, and Paul McCartney, 69, after invitiing both to a dinner party in the Hamptons in 2007. Well, four years later, Walters was shedding tears of at the couple's wedding in London on Oct. 9 (pictured), which she said was "beautiful and wonderful." 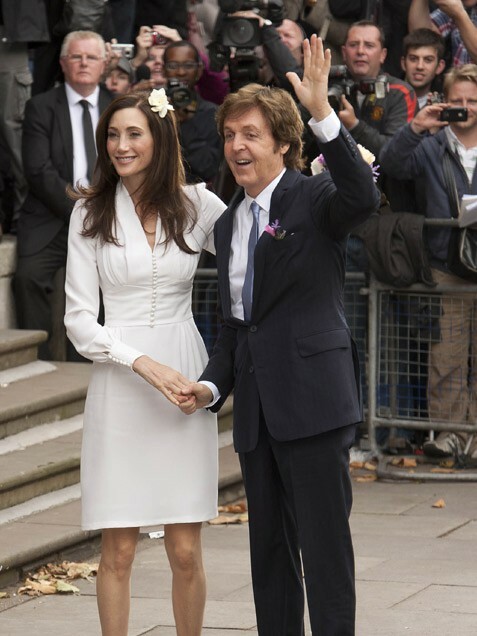 Engaged in May, the former Beatle and the American heiress seemed to have an uncomplicated relationship from the start -- surely a refreshing notion for both Macca, who finalized his messy divorce with Heather Mills in 2008 (which cost him $48.6 million! ), and for Shevell, a cancer survivor who was a single mom. McCartney summed up their relationship nicely to the U.K.'s Sunday Times, "I just like being in love."